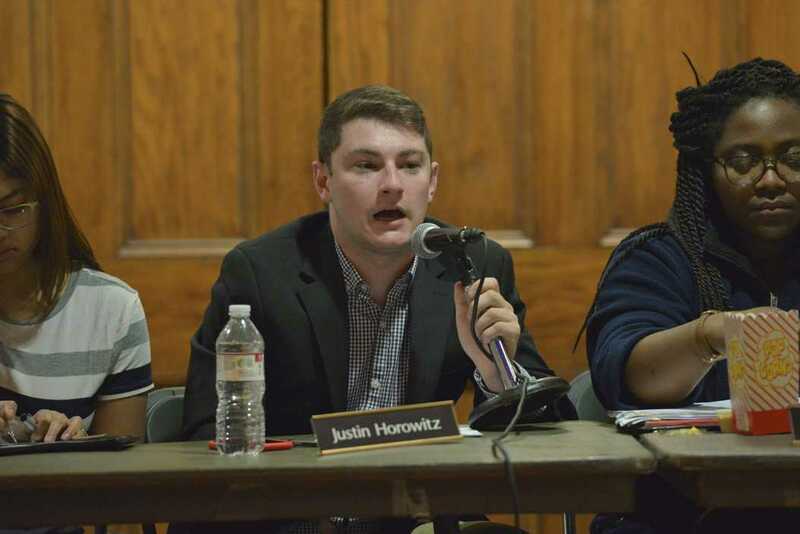 After promising changes to the Student Government Board governing code all year, SGB introduced four bills last night that would create new committees and provide students with online New York Times memberships. Two of the new bills will add a communications committee and the First Year Council into the official SGB constitution. These committees functioned this year in ad hoc form — subgroups that are typically dissolved once their task is completed. Adding the committees into the governing code legitimizes the communications committee’s role, according to Communications Director Kara Boutselis. Boutselis created the communications committee after discussing her need to delegate certain tasks within the board. SGB functioned better when committee members utilized their own specific skillsets, such as video production and graphic design, to advertize SGB news and events she said. “Since there are specific positions, we are able to pull amazing talent from this school,” she said. Since one of SGB’s primary goals in the coming year is to engage more students in decision making and idea gathering, Boutselis said the committee will be a vessel of student outreach. Chief of Staff Phil Anderson introduced two bills that SGB will pass at the final meeting of the semester next week. One bill will give all students a free subscription to The New York Times, transitioning from the paper copies that students currently have access to. At peak traffic –– Friday in Posvar Hall –– people were only removing 11 papers from swipe boxes. SGB representatives said that going digital will lead to higher student readership. “We thought we could appeal to more students more broadly. For us to provide [The New York Times] for 18,000 students online is cheaper than providing 250 New York Times and 250 USA Todays across campus,” Anderson said, adding that the switch will save the University $5,000 per year from the Student Activities fund. SGB will advertise the new online subscription in Arrival Survival packets and on residence hall desks for move-in, according to President Natalie Dall. The second bill authored by Anderson puts the First Year Council, a committee the chief of staff oversees, in the governing code.The First Year Council is a group of select first-year students who work with the board on SGB initiatives. SGB also proposed an amendment to their current meeting format that introduces an additional open floor at the beginning of the meeting –– in addition to the two later in the meeting –– open for anyone from the Pitt community to voice their opinion to SGB. Dall said more students will attend meetings with a decreased wait time to voice their opinion. This style is similar to the town hall meetings that SGB began holding monthly this semester. These meetings have not been well-attended. Dall also said she felt confident that the new opportunity would bring out students that would be more hesitant to come to a town hall. “Different people would come to a town hall than a public meeting. There may be a small area of redundancies, but it’s still our job to listen to student concerns,” she said. Enactus requested $2,218 for a national competition. The board approved $1,693 and denied $525. Women’s Club Ultimate requested $1,258.90 for a sectional competition. The board approved $320.34 and denied $938.56. Women’s Club Ultimate requested $1,339.34 for a regional competition. The board approved in full. Women’s Club Ultimate Requested $2,630.94 for a national competition. The board approved in full. Men’s Ultimate Frisbee requested $1,800.36 for a conference competition. The board approved in full. Panther Hurling Club requested $2,217.86 for the NCGAA National Championship. The board approved in full. Panther Hurling Club requested $1,273.88 for team equipment and uniforms. The board approved in full.